ere at Yakedo Akitas we are devoted to the preservation of the whole American Akita, encompassing appearance, stature and temperament. We are vehement about exhibiting and breeding bear-like American Akitas that stand out not only in the show rings but in a family setting as well. e firmly believe that Akitas, although not a breed for every individual, are a "complete" breed and their devotion and tenacity serve them well in the conformation ring, obedience ring and companion homes. e strive, through every breeding we do, to meet the AKC Akita Standard and believe that by consistently exhibiting and completing championships, we insure our Akitas are of quality worthy of being bred and worthy of assisting in assuring the future of the Akita Breed. 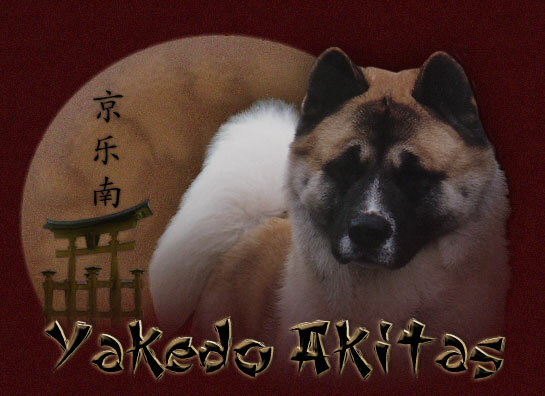 akedo Akitas offers an Akita that excels in American type and is sound physically, mentally and temperamentally for conformation, obedience and companionship. e hope you will enjoy "Our Family" of Akitas and hope you will come again soon. © Copyright 2004-2013, Yakedo Akitas.